The Department of Training and Placement is under the leadership of young education entrepreneur, Mr.Sampath Reddy Thigulla who has been striving continuously to match the students with their dream jobs, resulting in a win-win situation for the student and the hiring organization. 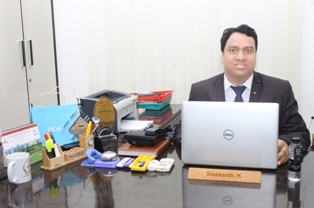 Mr. Sampath Reddy Thigulla is creative and highly result -oriented engineering professional who brings along Industrial experience and International exposure to bridge the gap between academia and Industry. Worked in IT for around five years with one year in India and around four years in USA. ☛ Training Students through internal and External Trainers as scheduled Plan training schedules. ☛ Negotiating and finalizing external training agencies. Off –campus training and Placement for Students. ☛ Liasoning with MNCs and companies to recruit their resource from the college. Interacting with University, Colleges and Media for effective relationship. Arranging Guest Lectures, Seminars and Workshops for students and organize Industrial visits tours of the students to the Industries in AP & Telangana. Empanelment of the Institute with companies for recruitment. Create a data-base of different companies known to the institute, names of the concerned people, their contact details etc.Compiling and preparing Alumni data-base.Create different mailing lists of HR, Marketing, Finance Managers, alumni etc.